When one thinks of history’s great painters, names such as Van Gogh, Monet, Rembrandt, and Picasso come to mind. All of these artists brought a unique feature to their specific period in art, thus achieving greatness through differentiation. However, many phenomenal artists who succeeded in a specific trait have unfortunately been relegated to the obscurity of eclectic, coffee table-sized art books. A name that is probably unknown to the majority of art lovers and non- Russian historians, is that of Arkhip Kuindzhi. Kuindzhi has many interesting paintings credited to his name, but none stand out more than those depicting landscape illumination. Combining the artistic techniques of shadowing, negative space, and illumination, Kuindzhi was able to make paintings “light up”, in a time period when electric lamps were non-existent in the region. Moonlit Night on the Dniepr was the paradigm of his illumination prowess, and truly stands out as one of the most interesting paintings in any gallery an art enthusiast may visit. Fortunately, I was given the opportunity to visit the Tretyakov Gallery in Moscow back in 2012, and this painting stood out as a diamond in the rough among other odd Russian pieces. Our tour guide breezed past this masterpiece without any background on its origins, so I made it a priority to revisit the work and get a chance to enjoy its wondrous qualities. 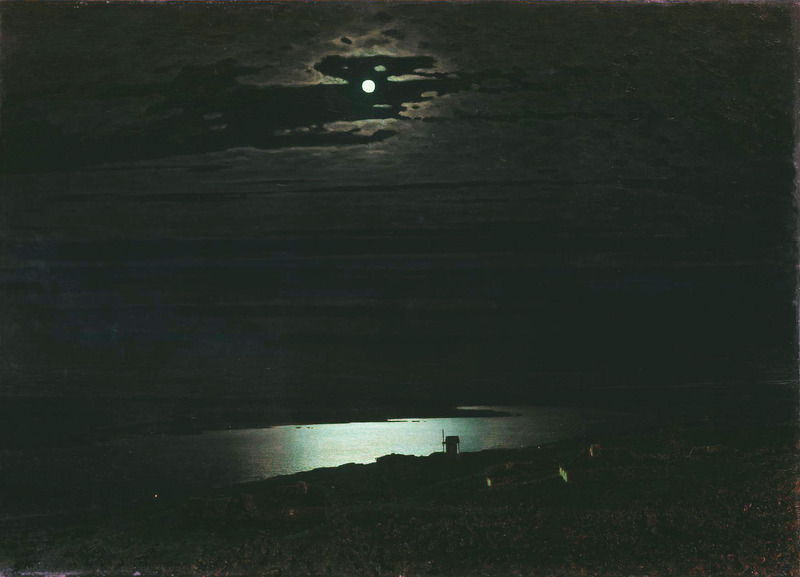 I remember very few paintings by name and location, but Moonlit Night on the Dniepr has stuck in my head to this day as one of the most interesting works I have seen anywhere in the world. Kuindzhi was one of many artists in the Peredvizhniki (Wanderers) movement, but made his mark on modern realism by truly living up to his “artist of light” moniker. Hopefully, art historians will eventually look back at Kuindzhi’s inventive techniques, and applaud them for their unique and almost impossible qualities. This is such a marvelous painting! I’m so glad you got to see it in person and could go back and admire Kuindzhi’s technique. I’m a big fan of his more well-known paintings of birch trees — the light almost seems to emanate from rather than illuminate them. Thanks for giving Kuindzhi some well-deserved blog time! the level of realism in this painting is mind blowing, it almost resembles early color photographs, and the way the light reflects and spreads across the painting indicates a deep and well used knowledge of the tendencies of light. I find myself wondering how many hours of quiet observation on moonlit nights it took the artist to learn how light behaves so he could re-create such a fantastic scene. It took me a while to realize that this was a painting. I’ve seen this kind of sight on a lake or at the beach when the moon is full. This painting reminds me so much of how much natural light the moon can provide for us. He captures everything so beautifully, it’s amazing!